She says she went from f/2.8 and 1/3 of a second to f/3.2 and three seconds exposures. It seems the difference in aperture (not even a doubling in light intensity) would not compensate for the increased light intensity of the ten times decrease in shutter speed. Is this correct? So, what you have here is a mixed lighting situation. The background and star notes are being lit via flash (check out their shadows. Nice and soft and from top to bottom. The main bulb cluster is on the left and yet it has no impact on those shadows) and the bulbs themselves are being lit...by themselves :-). As you can see, there's overlap there but also two unique controls: the bulbs are the only thing affected by shutter speed while the flash is the only thing affected by changes to its power level. So, in changing the exposure from f/2.8 to f/3.2 — the shooter brought down the amount of light processed from the flash (you can see that the highlights on the notes are less hot in the second example). They brought it down by 2/3 of a stop. Now, that would also bring down the light captured from the bulbs by 2/3 of a stop. BUT, they also brought the shutter speed from 1/3 to 3s (~just over 3 stops), increasing the the total amount of light captured from the bulbs by ~2.5-3 stops. So, in the end, the amount of flash captured was brought down while the amount of ambient (the bulbs) was brought up. See technique 2 in my answer here. It's a similar mixed lighting shot and another idea for you to test mixing flash and bulbs. Mixed lighting is a whole subset of lighting technique, there is a lot to it, but damn if it isn't a lot of fun. We don’t know exactly what 1/3 C means but we can surmise it a typo and should read 1/3 of a second. 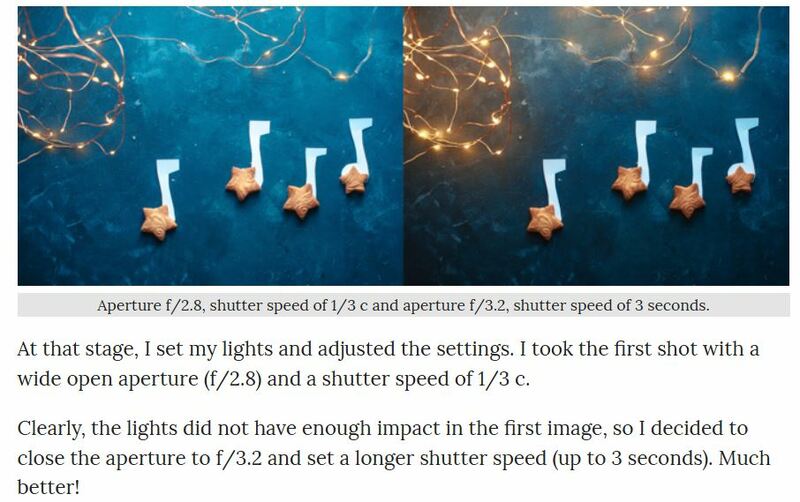 Assuming this is true, how come the second shot, using a shutter speed of 3 seconds, is not overexposed? This might be a mistake, however, the text of the example you cited reveals the author used an electronic flash as the main light source. In your mind, the difference between 1/3 of a second and 3 seconds is 9X. True, but this is photography- think of it as 3 stops --- additionally, an electronic flash outputs a flash of light that averages about 1/1000 of a second in duration. The key to understanding the difference in these two shots ---- the flash contributed equally to both images. It flashed and then extinguished. The difference in exposure is simply the accumulation of the ambient light, not the flash. We don’t know much about the ambient light except to say, it was likely feeble. Stopping down the lens reduced the exposure. Edit: reading the complete article in detail over lunch rather than the section in question and skimming the rest, the main source is a speedlight, which I missed while searching for more uses of 'flash' from the start of the article. - See Hueco's for the more detailed answer of what's going on with the dual exposure. Possibly a typo in the article (Photography websites aren't exactly renowned for rigorous peer review or anything.) or they've glossed over some additional post work. The 1st image seems to have exposure compensation set to 1/3 to brighten it. (1/3c) Turning the compensation off makes a darker image. Now going to a smaller aperture means a longer exposure which means the Xmas lights have more time to contribute to the ambient portion of the light. The brighter xmas lights makes the background even darker for the same full image meter exposure. The longer exposure also means less flash is used and thus even bigger differences in bright ambient Xmas light and flash lit blue background. Not the answer you're looking for? Browse other questions tagged flash exposure lighting off-camera-flash or ask your own question. Why did my northern lights pictures turn out totally black? Why does harsh light give darker shadows? Why did my lacrosse game pictures come out so dark?